It has been a bit of a challenge this year with so many volunteer functions happening this year. But I did manage to take a fun filled week in Vancouver, with 10 presentations in 5 days and a quick side trip up one of the trams to take a birds eye view of the snow covered mountains, as we were driving towards Whistler…a moment of peace. Thanks to Mike Storey and my sister Dawn from the Ladner Rotary Club, who organized all the presentations for me, I am forever in their debt. I wish I had pictures, and if I go back far enough in my emails I am sure I will find a few. I think I am roughly on target though, even though I got off to a late start. Here are our projects approved for this year. First, we have raised sponsorship for 12 primary school students. Unfortunately 2 students dropped out – one went to Vientiane to work and the other, Somnuek who is quite a bit older than the other secondary school students finished lower secondary school but opted out of going to high school. We also raised enough for 2 full time university student and a part-time university student who is trying to raise enough money (through working) to buy a motor bike and go to university next year. Finally, we raised enough for Jouey to continue the second and last year of our program as a teachers apprentice, and Tongsi who has graduated from law school and entering his first year as apprentice. In total, we raised about $21,000 CDN. Water Filters – we have raised 128 water filters out of our target of 500 for the fiscal year (ending June 30, 2017). While it seems like a long way to go, we hope to raise 200 from another donor, bringing the running total to 328. We are hoping to do one distribution just before Christmas and a second on in January. If you are interested in donating a water filter for a rural village family, I hope that you will contact us. The cost is $110 CDN or $80 US that covers transportation, the filter, stand and bottle. In return, you will get a tax receipt (if donation is in Canada) and an email of a picture of the receiving family with your name on the label, or a name/phrase of your choice. You can send email us a picture too if you prefer, to use as the label instead of your country flag. Sample of Picture emailed to you as thanks for your donation. This is a perfect gift for someone who has everything they need at home. It is a popular donation In Loving Memory of someone close to you, as well. Next up is our large water project we are planning for this season. 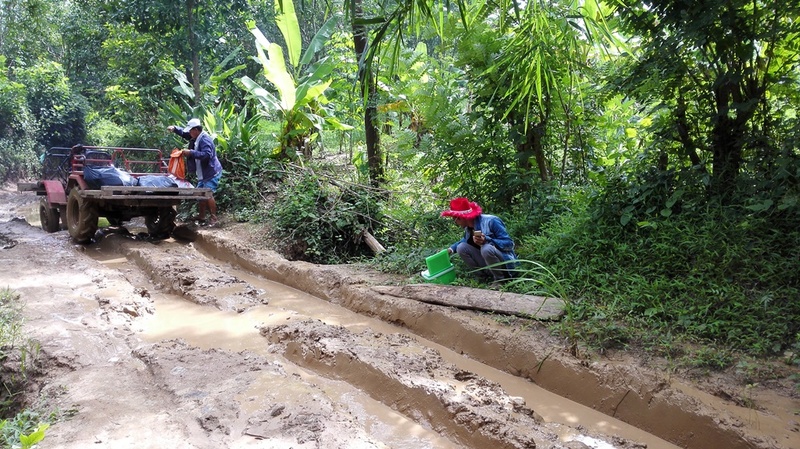 We hope to raise enough to put a permanent water supply to a village that is spread across three hilltops in a rural district of northern Laos. The plan is to build a dam at the source, run pipe to the highest peak into a tank and run from their to the other three peaks. Tap towers will be constructed throughout the three hilltops. We are hoping that this project will be primarily funded by various Rotary Clubs here in southern Ontario, across Canada and beyond. The project is estimated to be $78,000 CDN. To date we have confirmation from various clubs totalling $28,000 although much more is expected with presentations booked throughout the fall. If we have to though, we may break up the project into two phases or, use donations from individual donors to help make this happen. 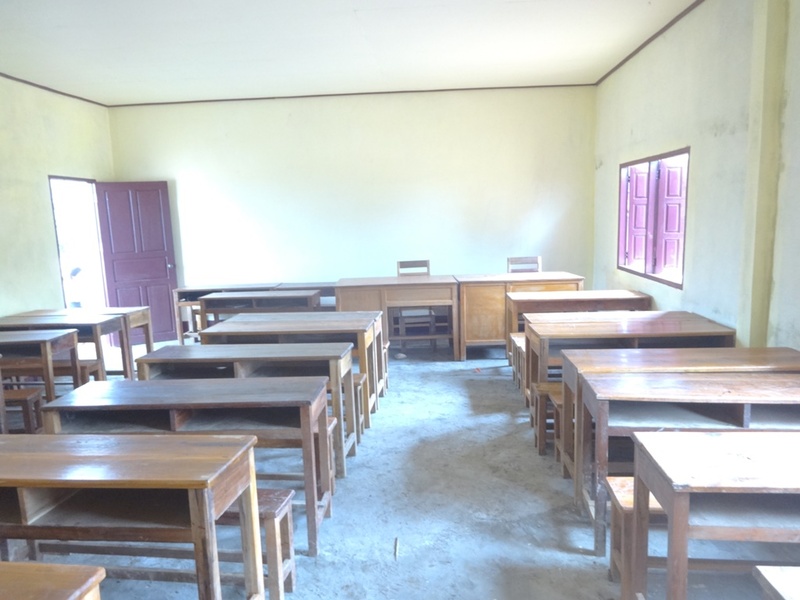 We decided not to do a school this year, due to costs and our low Canadian dollar, however we will be supplying desks for a school with a generous donation from Global Change for Children. We also have a number of smaller projects we will look at, if funds permit. 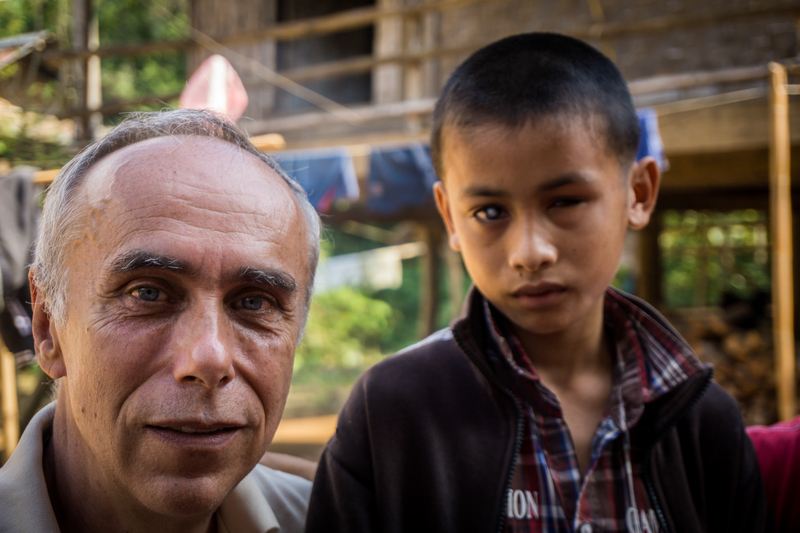 One of them is to take a blind child to Thailand for tests to see if he will be a candidate for an eye replacement. I have posted this picture before, but if he is eligible, we will likely start a go fund me campaign. If not, we will look at options for training at a special blind school. We are currently investigating to see if anything can be done and will take him (and his father) to Thailand when I have to exit the country. I sure hope we can do something. We do have a number of other small projects we are considering and will advise further if positive decisions are made. Last but not least, will continue to distribute free feminine pads to secondary school girls in hopes of increasing enrollment. As part of the last distribution of water filters for the year, a lot of planning went into the visitation and participations by a large Malay contingent. 29 visitors in fact! Siphan was a little nervous about managing this by himself although we hired a couple of local people to assist. By all reports, they all came away with positive experiences. The cooked for a village, they brought thousands of feminine pads for the secondary school girls, held activities with the students and of course distributed a lot of water filters. Siphan delivered water filters to many villages prior to their arrival so they could spend more time with the villagers. I am sure they would have a lot more to say if they wrote this article but most or all have said they would return in a heartbeat. The Malay team, vowing to come back! 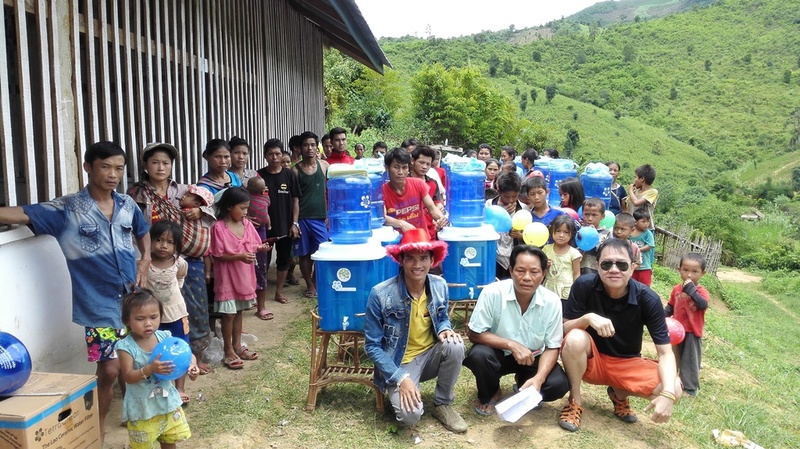 In July, we were excited to distribute another 250 water filters! This brought the total number of family water filters distributed in one year to 764! That’s about 3,820 people with clean water. 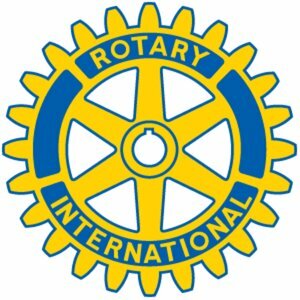 To get to this stage, The Rotary Club of Scarborough, Ontario matched all water filter donations received from their club members and friends of the club, over a two week period. That was 58 water filters! Also, our dear friends Barbara Seagram, Alex Kornel and Patti Lee hold an annual bridge fundraiser for us and raised well over 100 filter system donations! They are such an inspiration. We also had Daniel, representing a Singapore group, SG L.I.F.E. who donated 30 filters and another group from Malaysia who also donated a lot of filters. But first, Daniel was kind enough to write his own blog entry! so cool! Started the funding drive for our initial project for 30 water filters system for a remote village North of Luang Prabang. (an Unesco World Heritage site and was voted the 10 best places to visit). 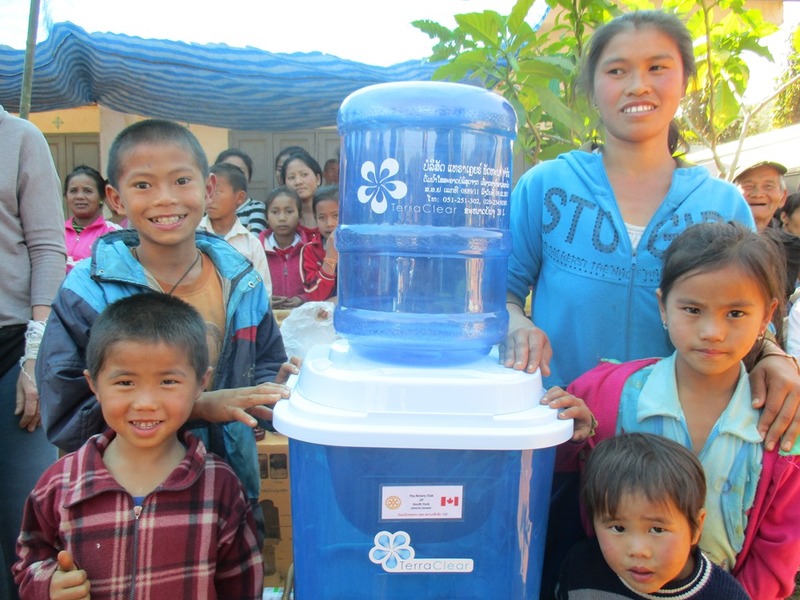 Steve’s organization had previously donated 30 water filters system to a village called Ban Lang Pha, a very remote village in the interior of Laos forest near the Nam Ou 2 Hydro Dam project. We were glad to sponsor the remaining 28 units to the 58 families living there and 2 other units were delivered to another village which was missed out previously. Made my trip by flying from Vientiane Capital to Luang Prabang, an easy 50 minutes flight by Fokker. Was met on arrival by a smiling Siphan, (Steve’s local coordinator) and immediately was taken in by his friendly nature and pleasantly surprised by his good command of English. A quick check-in to the guest house (US$13/night with a Queen sized bed with air-cond and hot water) and headed off to the markets to purchase school stationeries for 60 plus primary school going children. Of course when you are dealing with kids, you need to add sweets and other goodies and we were glad to provide all these happy requirements. Bought some basic necessities (toothbrushes, toothpaste, soap and etc – things we all take for granted) for the villagers. After a very simple dinner in one of the lanes at the famous Night Market of Luang Prabang, decided to call it a night as we have an early morning journey to Ban Lang Pha. Maybe I was too excited as I had a rather restless night and was kinda tired when woke up at 6.00am but on seeing the ever cheerful face of Siphan, I was eager to get moving. Siphan had earlier hired a minivan for the 2 hours road trip to a place called Ban Dong Nguen. Our boat ride was waiting for us to take us across Nam Ou river and we fully loaded the small little sampan (boat) to make the river crossing and our tractor transport was already waiting at the landing to take us to Ban Lang Pha which is a mere 18 km ride but took us over 90 minutes of backbreaking, tough and rough ride due to the treacherous muddy condition due to the rain that felled for several days before our visit. It will be a road trip that will forever remained in my memories. The weather was kind to us as it would cloudy and whatever pain and suffering I had was easily forgotten on reaching the village and seeing the entire village welcoming us. It must be the red awful hat that Siphan was wearing. Haha. 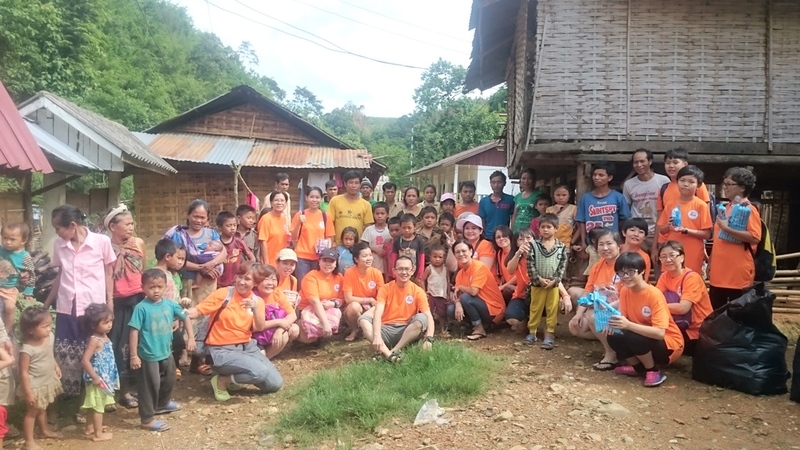 The villagers quickly helped us unload all the stuff and the village head organized the distribution of the water filters system to the families at their community hall. I had fun and was truly blessed to present the water filters to the individual family and was teasing and joking with them. I think they were surprised to see a Chinese man able to speak their language. 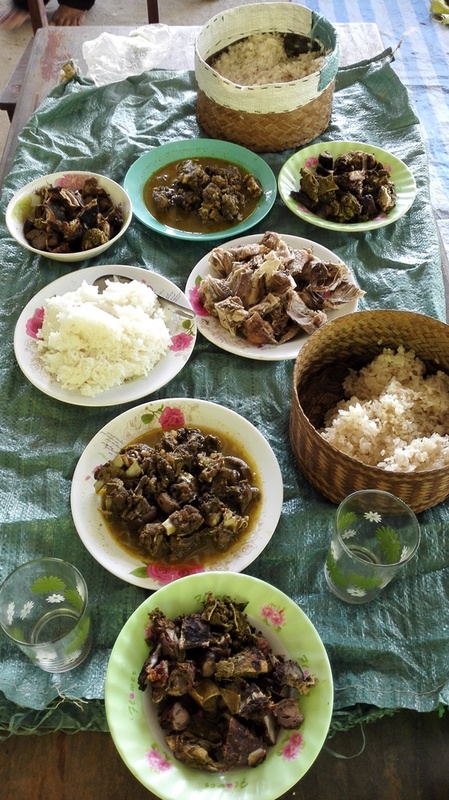 The villagers had organized a thanksgiving ceremony (Baci in Laos) for us to thank us for the gifts and luckily for me, I had no issues in eating Laos food they had prepared in our honor as I have lived here for over 3 years now. There was even a jar of their local moonshine ready for my consumption. Even had our fortune read by the village shaman. These villagers are really simple people even though they have so little but there always a smile on their face and readily will share their meals with you. 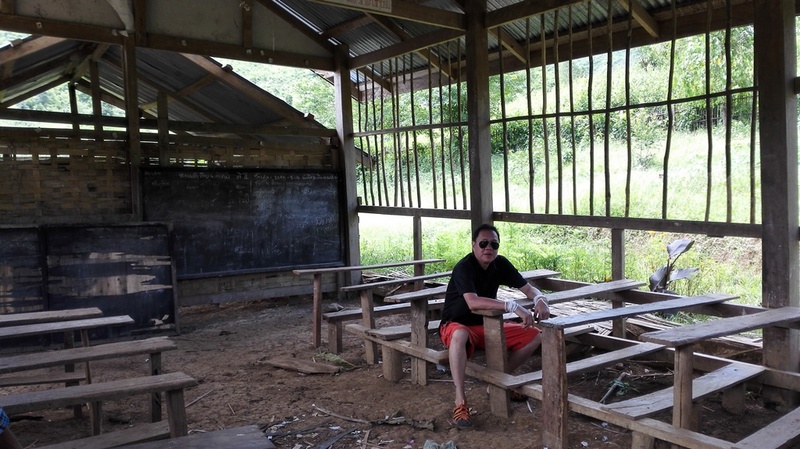 Took a tour around the village by the village teacher and was shown the pathetic rundown shack of a place called school. I was totally shocked at the poor condition and almost shredded a tear. After giving out the goodies to the children, it was time to say our farewell and we informed the villagers that we will look into their request for the construction of a 2/3 classrooms and a pipe water system. 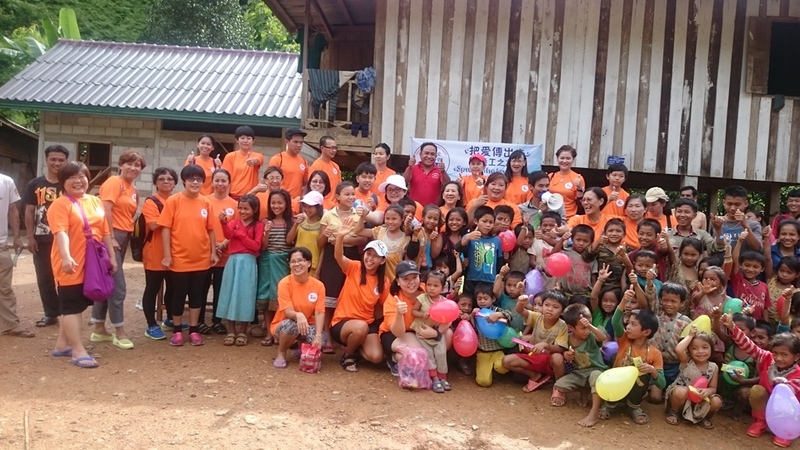 Seeing the smiles and the happy faces of the kids made me forget about the long hard ride down from the mountain. We survived the journey down from the mountain although we had to get off several times due to the bad condition of the jungle path and were almost thrown off as I lost concentration for awhile due to the intense hot sun and the light drizzle that accompanied us all the way. Arrived safely in Luang Prabang in the evening and I actually looked forward to my next trip into the remote again this coming December. Hopefully we are able to meet some of their request but providing the kids with an education will be our top priority. It has been a hectic time over the summer as we are challenged with new fundraising season. First however, let us bring you up to date on the last of the projects from last season. It was a very foggy day, just in advance of the rainy season. 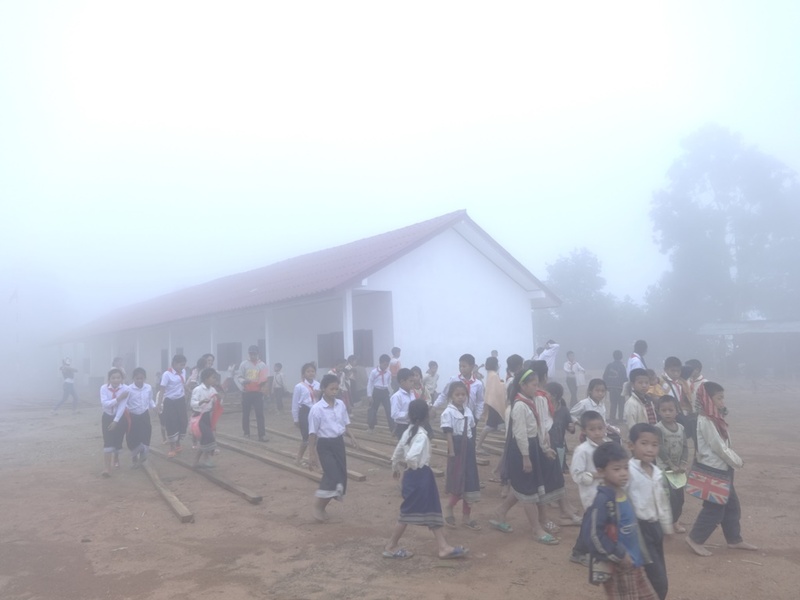 With the high altitude I suppose the school was in the midst of the cloud cover. Inside one of the classrooms…in fact the final coat of paint took forever to dry. 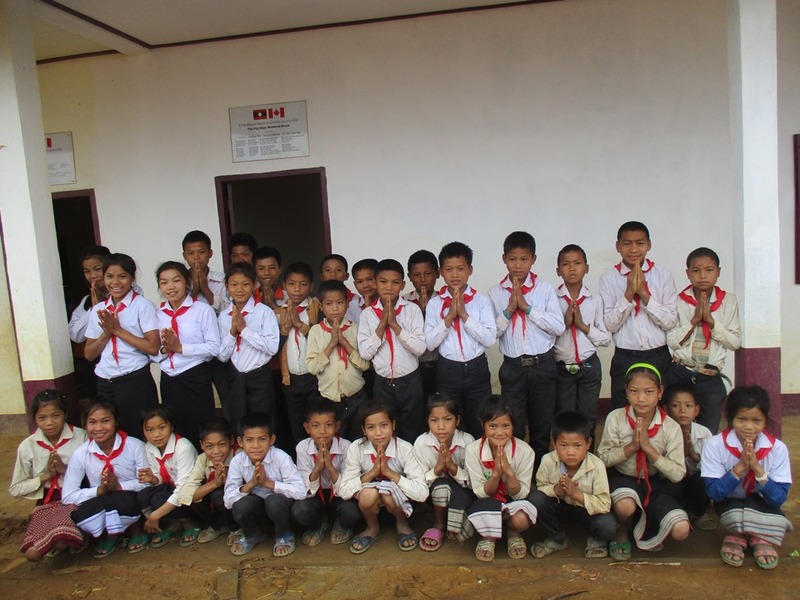 The school children show their gratitude to our generous donors. 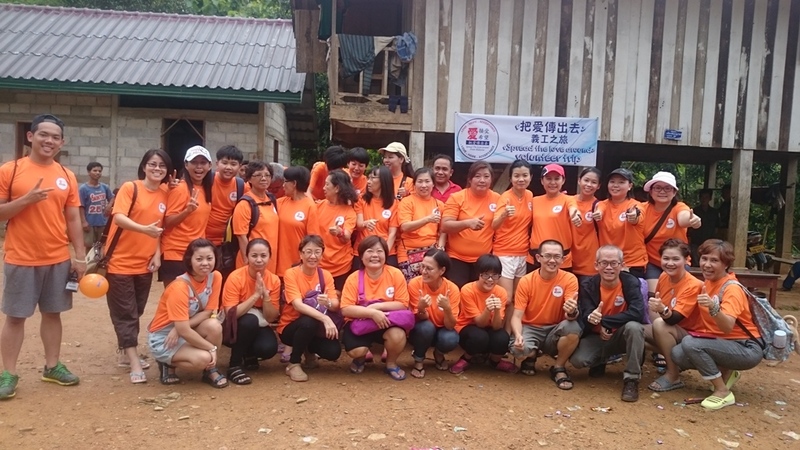 The last stage of the seasons projects was to build one last bank of toilets for the village in Pha Yong, bringing the total number of toilet banks to 11. In total there are 25 toilets in the village. We understand that the village is to be deisgnated a heritage village for purposes of inviting tourists to experience their way of life. With Hmong and Khmu tribes, plus the surrounding scenery, and some pretty good infrastructure there now, it is a obvious choice. As such we can all pat ourselves on our backs for helping the villagers achieve this goal. Finished Toilets, with thanks to so many Rotary Clubs! We had hoped to be able to do one more distribution of water filters. With our drop in the Canadian Dollar and the need to fill a truck (holds 250 systems), it was doubtful we would reach this target. BUT WE DID IT! See more in our next post.